To combat Europe’s financial and economic crisis the European Central Bank (ECB) has pursued quantitative easing (QE). Such money-printing-policy in the name of crisis management and financial stability acts as a disincentive for banks to restructure their balance sheets and adopt healthy business practices, argues John Doukas. Ultimately, it undermines the value and purchasing power of any currency and will lead to inflation far above 6% across Europe. While central banks have been known for using their policies to keep stable prices and economies avoid the adverse effects of inflation, since the 2007-2008 financial crisis they have been engaged in an unprecedented monetary expansion in an attempt to stave off financial and economic downfall. The ECB, despite its previous reluctance to buy sovereign debt, last December under the leadership of Mario Draghi, inflated its balance sheet with the announcement of €3 trillion in cheap 3-year loans to banks. 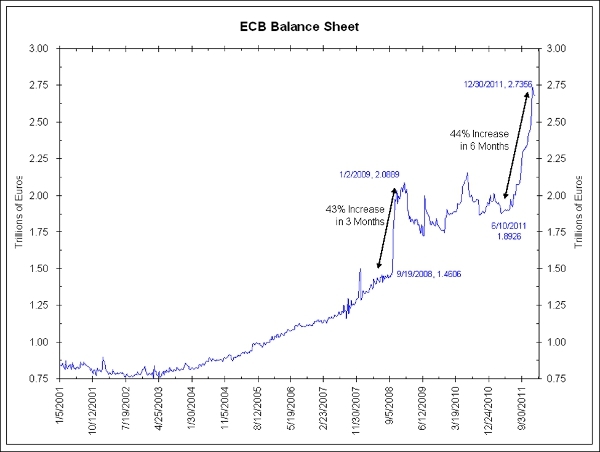 This unprecedented balance sheet increase, as the following figure shows, relative to the previous ECB largest credit injection in August 2007 when the ECB lent €95billion, has been viewed as a major monetary policy change (with a 44% increase from late 2011 to late 2012 to the end of this year), but consistent with its credit in late 2008/early 2009, aiming to restore bank liquidity and economic activity in the Euro zone. This quantitative ease (QE) also mirrors the enormity of the economic and financial problem the Eurozone has faced since the beginning of the 2007 financial crisis followed by the debt crisis of its periphery. The ECB’s massive QE injection helped reduce somewhat the cost of government borrowing for Italy (from 6% to 5%) and Spain (from 7% to 5%) during the January- March 2012, but the yields for both countries are up again at 6% and expected to rise further. Hence, the ECB’s loose monetary policy had only made a small dent in the market’s sovereign risk perceptions. Moreover, this refinancing of European banks, which was expected to have a trickle down effect on the real economy (increasing lending availability to businesses), has failed to produce any tangible results. This is mainly because commercial banks are loaded with non-performing (toxic) real estate assets (see, for example, Spain’s real estate-trouble lender Bankia that has failed and now is expected to cost Spanish tax payers another 10 billion Euros since July 2011 for a total of more than €14.5billion Euros), low grade sovereign debt and, hence, they have been reluctant to lend to businesses. As of today, banks have channeled only a small fraction of this liquidity obtained from the ECB into the private sector of the Euro zone economy. They have also been hesitant to buy government bonds in an attempt to easy the sovereign debt crisis. Instead, some banks have started to sell off government bonds resulting in higher government yields and rekindle the threat of the Euro zone sovereign debt crisis. The question, then, is what the ECB will do next? Will the ECB increase its lending again to banks in an attempt to start lending and resume government bond purchasers? Another interesting point that is worth pointing out here is that the huge ECB injection of liquidity into the banking system is that it has created disincentives for bankers to restructure their balance sheets (increase the moral hazard problem). Consequently, banks turn out to be less resilient to withstand the adverse effects as the economic crisis is deepening. Deeper recession, in turn, is expected to worsen the Euro zone fiscal problems, especially if the Fiscal Compact is not accompanied with a growth plan for the EU periphery members, creating more distrust in financial markets. 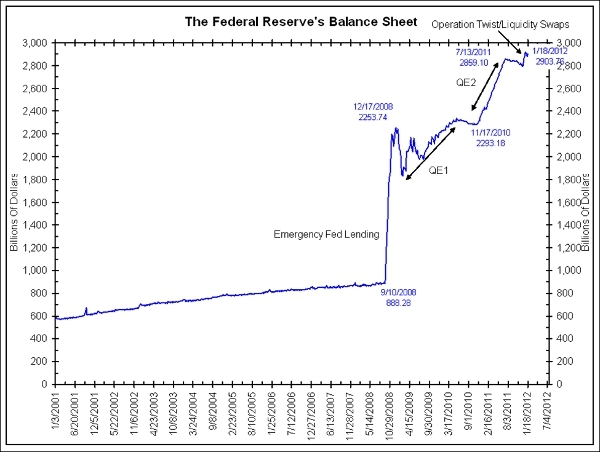 The US Federal Reserve, as the next figure shows, has also been inflating the money supply in order to resuscitate the American economy. The Bank of England and the Swiss National Bank have followed a similar money supply trend in the recent past. The Bank of England has adopted similar QE actions in response to the global financial crisis. As a result of these aggressive balance sheet increases, one important question that pops up is whether financial markets should feel comfortable with the “new role” of the major central banks. To put it differently, are these massive QE policies by the ECB and other central banks just an aberration or a new policy paradigm? These policy actions, given that central banks used to focus on inflation targets and followed conservative monetary policies, are considered extraordinary as the power to create money comes with the major responsibilities of (i) not undermining the value (purchasing power) of a currency and (ii) provide emergency funds to the financial system during times of financials stress (assuming the role of “lender of last resort”). However, the loose monetary policy of ECB and its major counterparts since 2007 has been associated with asset purchases of poor quality. ECB is loaded with risky sovereign debt while the Fed’s balance sheet has tripled in size since 2007 with the outright purchase of mortgage backed securities. It is interesting to note here, that the purchases of sovereign debt by ECB led to the resignation of Jürgen Stark and Axel Weber, two top ECB German officials. Their resignations reflect their sharp disagreement with ECB’s recent policy practices. Under the European Union treaties, the ECB’s funding of governments is considered illegal because it is viewed as a major threat for the stability of the monetary union. Prior to his ejection from office, Nicolas Sarkozy, however, was a vociferous critic of the ECB for not inflating earlier through massive credit creation policies to reverse the distressed Euro zone economic environment. In other words, what we have seen in the commencement of the recent financial crisis is that central banks have engaged in policies designed to stimulate the macro-economy. This practice, however, belongs to the government (fiscal policy) not to central banks. This central bank policy-switch (to engage in actions outside of their domain) seems to indicate that central banks have lost their independence as governments have exhausted their ability to restore economic activity and enhance economic prosperity for their citizens. In fact, this type of central bank actions diminished the incentives for governments to restore economic activity by undertaking the necessary fiscal and structural reforms. The massive influx of money into the banking system has failed to go to work as economic activity remains anemic with high rates of unemployment on both sides of the Atlantic. Printing unlimited amounts of money (believed to be inflationary) does not lead to unlimited economic prosperity. Instead, it leads to asset price bubbles. While credit availability is essential for the well functioning of the capital markets and the economy, credit bubbles do not translate into wealth creation. In fact, they have always been wealth destroying. The aftermath of 2007-2008 financial crisis, is the most recent example. Central bank policies, instead, should stick to promoting growth and economic stability. The Fed’s excessive credit policies have been recently characterized by the Texas governor Rick Perry as “treasonous” while Ron Paul, another influential figure in the Republican Party, has labelled central bankers as “intellectually bankrupt”. It is unfortunate, to say the least, that monetary officials and some policy-makers continue to view this excessive money supply growth as non-inflationary, but this is mainly because housing makes up more than 40% of the Consumer Price Index (CPI). In other words, if you factor out the depressing effects of the feeble real estate market, the price inflation in all other CPI components is more than 6%. The loose monetary policies of the ECB and the other central banks, suggest that they view the current crisis as a liquidity problem rather than as an insolvency problem. Pumping more money into the system makes banks and corporations more dependent on cheap funding while it misallocates capital through asset mispricing that prepare the ground for the next crisis that might be even a bigger catastrophe. This circle has repeated several times since the early 1930s without learning from the previous crises. Wealth creation requires policies that guarantee currency (purchasing power) stability, higher productivity, more savings and investments. This is the only path to economic prosperity. Our current financial and economic problems cannot be solved with additional fiat-money easing policies. If central banks keep on flooding the markets with cheap money, as they have in the recent past, they risk losing not only their credibility but also their policy effectiveness in maintaining “sound” money. Printing more money, in the name of crisis management and financial stability, acts as a disincentive for banks to restructure their balance sheets and adopt healthy business practices. Worst, it increases the moral hazard problem. John Doukas is the founding and managing editor of European Financial Management (EFM), the leading journal in European finance. He is also the founder of the European Financial Management Association (EFMA). He is the William B. Spong Jr. Chair in Finance and Eminent Scholar at Old Dominion University, Virginia (United States). He is also an Associate of the Judge Business School at the University of Cambridge (United Kingdom). He earned his Ph.D. in Financial Economics at Stern School of Business, New York University. Erroneously you write that these QE policies have led to “excessive money supply growth”. The numbers you show are about the money base, not the money stock. There has been a very strong increase in the money base, not in the money stock. The latter (M3) has increased by only 1 to 2% a year in the Eurozone, way below the target the ECB has set, i.e. 4.5%. Put differently the large increase in money base has not filtered through in the real economy and has not led to an increase in the money stock, creating zero inflation pressure. It’s hard to deny the numbers which undeniably show that there has been an excessive ECB money supply growth. The reason that the unpresedented QE of ECB has not filtered through the real economy and not seen any inflationary pressueres yet is mainly because the banks in the Eurozone are in a terrible shape (see Spain more recently). Simply put they are not lending! If the M3 is still below the ECB target of 4.5% and I do not disagree with Paul de Grauve on this, the question is why the ECB does not further increase its monetary base in order for the money stock to trickle down to the real economy? A further QE easing in the Eurozone, could also force the Euro to depreciate which could amplify the infationary pressures in the eurozone.The ECB is aware of the potential threat of inflation and, hence, ingoring it is rather naive.